We enjoy Cinnamon Toast Crunch in our household (yes I know it is a sugary cereal, but it is so yummy). 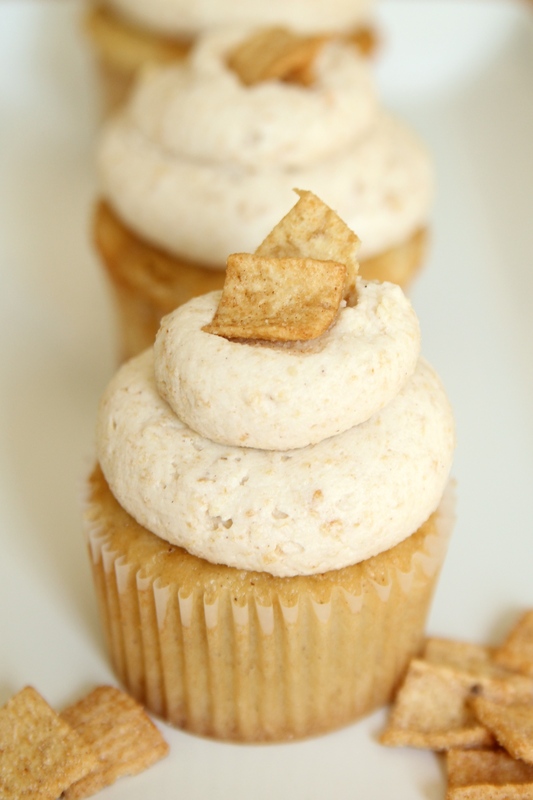 When I came across these Cinnamon Toast Crunch Cupcakes from BS in the Kitchen, I knew I had to try them. The real question is Can you eat these for breakfast? Pour your batter into cupcake liners and bake for 13-15 minutes at 350ºF. Once a tooth pick comes out clean, set aside and allow the cupcakes to cool before icing. While letting them cool you can start making your icing. Mix all the ingredients together until you get a desired consistency. After icing the cupcakes, sprinkle with cinnamon sugar (which is just equal parts cinnamon to sugar), and top with a Cinnamon Toast Crunch square, place in mouth and enjoy! The recipe makes roughly 24 cupcakes.